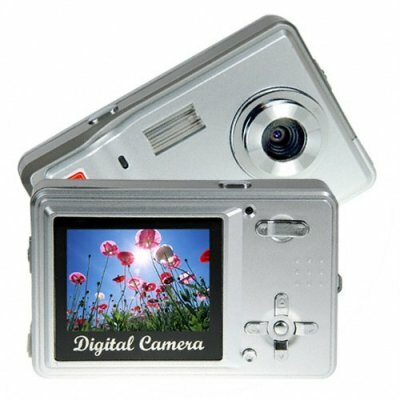 Successfully Added Palm Sized Point and Shoot 5MP Digicam - Silver to your Shopping Cart. 5 Megapixel Digital Camera with a easy to use design, but still capable of taking high quality 5MP digital pictures (up to 12MP via interpolation). If you are in the market for a new pocket sized point and shoot digital camera, look no further than this wholesale beauty. It comes with features you would find from many name brand cameras, but without the high price tag to go along with them. Such features include high resolution JPEG pictures and MPEG4 AVI video, easy to adjust picture settings such as ISO, sharpness and white balance, the use of standard batteries, and this camera is even can be used as an active PC Web Camera! Make a healthy profit for yourself by ordering in bulk and reselling this easy to use, but high powered digicamera at a price that your customers won't be able to pass up. Pocket sized easy to use camera capable of taking up to 12MP pictures (4032x3024). 640x480 AVI MPEG4 Video Clips. Uses AAA batteries. No need to buy expensive proprietary batteries. Take it out of the box and start using. Simple button controls allow even a novice to become a digital photo master. If you wish to make comments or reviews about this product, login and use the product review box. Please open an inquiry ticket if you have questions regarding this product.